Description: Covered wagon at the media rollout, Indian Hills Elementary School. Between 1846-1853, Mormons infrequently used the Dragoon Trail between Montrose, Iowa, to what is now Des Moines, Iowa. 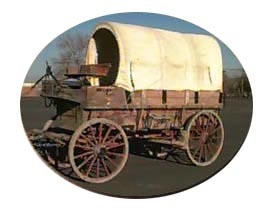 Between 1849-1859 they sometimes traveled the Ox-Bow Trail, a variant of the Oregon Trail, which extended from Nebraska City, Nebraska, to Fort Kearny on the Platte. Then from 1860 to about 1866, Mormons infrequently used the Nebraska City Cutoff Trail, another variant of the Oregon Trail, which replaced the older Ox-Bow Trail, from Nebraska City to Fort Kearny. A few Mormons, between 1846 and about 1853, also used the little-known-today Trappers" Trail between Bent's Fort, in what is now Colorado, on the Arkansas River, to Fort Laramie on the North Platte. During the 1850s and 1860s some Mormons also traveled The Overland Trail from near what is now Sidney, Nebraska, to Fort Bridger. A major trail variant even appeared in Utah. This was the Golden Road, a 42-mile-long variant of the original Mormon Trail in Utah. Between 1850 and 1869, many Mormons preferred this variant, which left the 1847 trail at the mouth of Emigration Canyon and entered Salt Lake City via Parley's Canyon.